Interview with Tracy Baker, on a self-funded mission to bring clean water to students in Kalisizo, Uganda, through the Walk for Water project. Q: How did you get into helping others in Uganda? How did that all start? It started about 10 years ago. I was with a group called Toastmasters and was invited to a fundraiser, and at the event, I saw all these pictures of kids carrying water and it was then I realized that over a billion people did not have access to clean water. To make a long story short, while at the charity I met a fellow Advisory Board member for Childcare Canada, Samson Nabbiba, originally from Uganda but who lives in Canada. We lost contact for some time, but we reconnected 3 years ago, and I found out from him that he had started his own charity, Yavin Society. So 2 years ago, I went on my first mission to Uganda with Samson. The very first visit, we went to Matale school in Kalisizo village. It is where we held our first Walk for Water, and the upcoming April 26th Walk For Water will also be held there. My first trip was a self-funded trip [but with money raised for a lunch program to feed the students of the school for one day, altogether about 150 students, which also resulted in us supplying school supplies for the entire school]. And I saw a lot of poverty there. You don’t know how devastating the lack of clean water is until you spend time in a village and you see kids walking with rags for clothes, with no shoes, carrying jerry cans and walking huge distances to get water. When you see that firsthand, that changes you. The children at this school need to walk one and a half kilometers uphill, which is about 3 kilometers both ways, to get their daily water. Many schools have that problem where the kids are not at school full-time because the kids are too busy getting water for their families. Water is everything. This is now my life’s work, to do what I can to help these kids in Uganda get clean water so they can go to school full-time and get an education and move on and become all they can be. 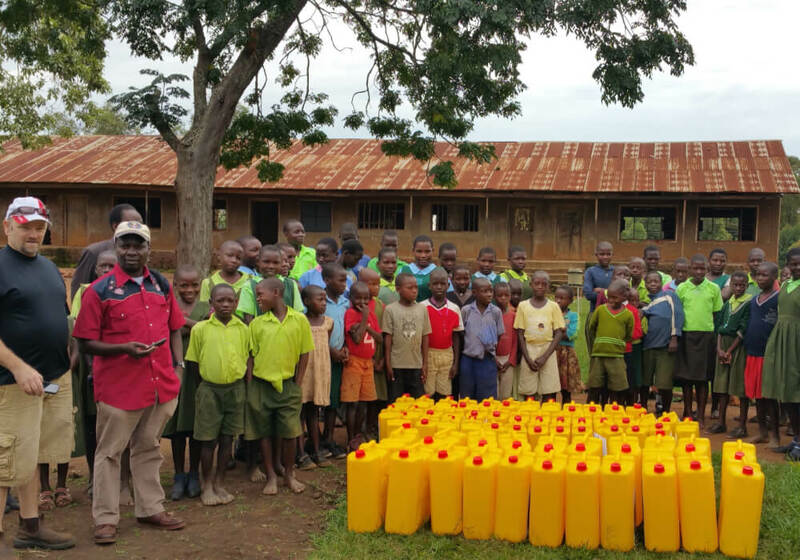 Our present objective is to build a well right at their school, which will cost about $10,000. ‍Q: So what is it that Walk for Water accomplishes? Our next Walk for Water will be this coming April 26. With Walk for Water, we hope to raise awareness about the lack of access to clean water in Kalisizo village. And there are online forms for people to pledge money towards building a well for the school there. Q: Why don’t you host the Walk for Water in Canada to raise the money? Why go to Uganda? Our mission is two-fold, the most important being to raise awareness in Uganda for the government to help the schools access clean water. That’s our first priority. Later on, we’ll extend it to Canada and the US. But actually doing it in Uganda, in the country that needs the water, will hopefully attract volunteers and funding. We’ve had success with other Walks for Water with other charities, with successful wells built in Kenya and other locations. But at present, we’re having difficulty securing funding because Yavin Society is a very small charity. It’s only myself, Samson, and a couple volunteers. We’re still in the development stage, but I’m flying out at the end of March to Uganda, and I’ll be working on filming a video that we can share back at home with church groups. This is not something I’m doing just once every 5 years. I’m not going to be done until I see clean water in every school in Uganda or make headway with the Ugandan government to actually help schools access clean water because, essentially, education is hampered by a lack of clean water. Editor’s Note: To learn more about Yavin Society and to find out how you can help Tracy Baker bring clean water to kids in Uganda, visit www.yavins.com.